We are surrounded with an abundance of things to see and do. 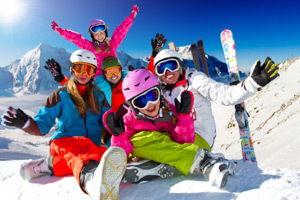 In Winter you can ski, ski tour and cross country ski in Annaberg, Puchenstuben and Lackenhof. In the warmer Summer months you can explore by foot, bike or by water. A few of our favourites include The Ötschergräben, riding the Mountain Karts, swimming in the Earlauf or hiking to the Geissenberg Alm. If you need any ideas for your trip please ask us, we are more than happy to help. With Annaberg, Lackenhof, Gemeinde Alp plus many more all close by we are spoilt for choice. Great Summer fun for all the family in Mitterbach. 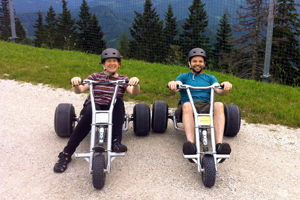 Travel down the mountain on a 3 wheel mountain Kart! 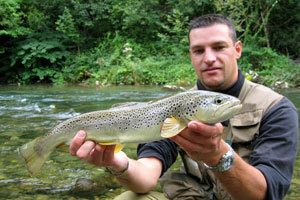 The rivers in the Pielachtal are stocked with stunning Trout and Grayling. Good places to fish are the Erlauf and the Pielach. The Falkensteinmauer in Frankenfels offers both Traditional and sport climbing. 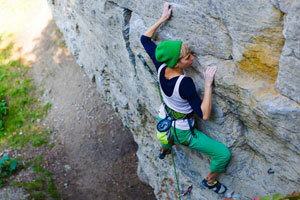 With lots of grade routes its a climbers paradise. Surrounded by mountains, forests and Alms, we are ideally situated to explore the hidden gems of the Austrian wilderness. 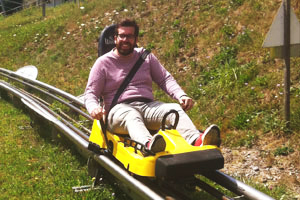 Located in the next village in Türnitz the mountain roller coaster is great fun for all the family. Why not relax and take a swim in Lunz am see or the Erlaufsee. When the weathers hot it's a great place to cool off.